This Silver Clutch Bag is Great for Wedding and Parties, it's luxurious and shining with diminutive rhinestones, Hollow Flowers, Artificial White Mellow Pearls and paillette decoration. Every bag has a detachable shoulder chain, you can use it as shoulder bag, handbag, clutch Or purse. Two rooms inside, it can hold everything you might need like 4.7" cell phone, lipstick, nail polish, poweder puff, tissues, card, etc. And the zipper layer inside can keep something important and easy lost. It looks absolutely stunning. Size of Chain: 116cm unfolded, about 50cm using length. 4. Avoid rain and water as much as possible! 1. MATERIAL: This clutch bag made of high quality synthetic with glittering rhinestone decoration. Different design on the front and back side. 2. Useage: Can be used as many different styles, Like Clutch, Cross-boy bag Or Purse. It's combined fashion with classic. Fashion Material and Classic Shape Design, you can attend a wedding, family reunion, dinner party or evening party with it. How to open? Don't twist! Just lift the button up gently. 3. Storage: Every bag has two rooms and a zipper orgnizer. You can put mobile phone, cosmetics/makeup, cards, etc. 4. Color: Classic Silver, designed for use during special occasions with formal clothing. 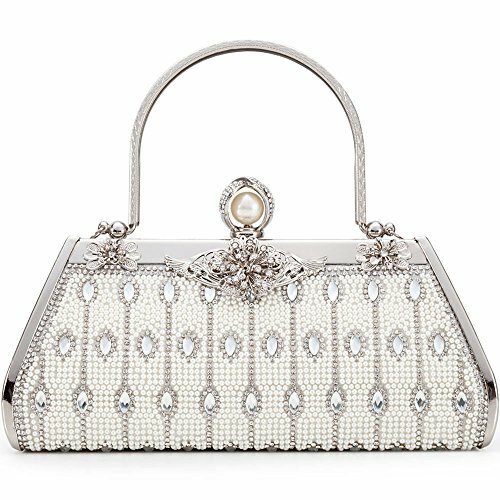 The bag has a unique Button Shape, a big ivory artificial pearls decorated by arched cover full of rhinestones, which is so exquisite and elegant.